Winnie’s Vacation: Memory Monday July 10, 2017. Good Monday morning to you from Sandbridge Beach where it is beautiful today and has been for the last few weeks. As long as you consider hot, sunny weather and a cool ocean to dip into beautiful then this is the place for you. Speaking of hot and a cool dip we introduce you today to Winnie. Winnie took a vacation recently to Sandbridge and took a cool dip in the water on a hot day. 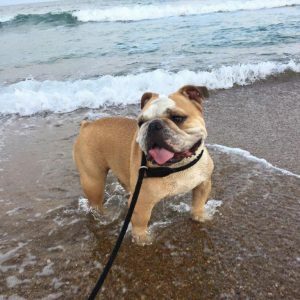 We understand from Winnie’s master, Karen Dunkum of Dilwyn, Virginia, that this was her first visit to the beach, and she thoroughly enjoyed her time with us at Sandbridge Blue. 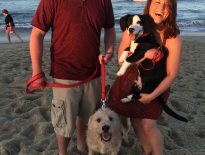 We are of course a very dog friendly vacation rental firm with more than 10 percent of our properties allowing dogs to stay with you at NO EXTRA CHARGE! Thanks for reminding us of that Winnie! She looks like she is enjoying the water. Thank you Karen for sharing your photo memories. We look forward to serving you and your whole family again in the near future. Next Next post: Dogs and Dunes: Memory Monday July 17, 2017. Memory Monday Photo Contest	Dogs and Dunes: Memory Monday July 17, 2017. 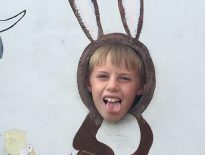 Memory Monday Photo Contest	Family Fun: Memory Monday July 3, 2017.